The line-up for the very first Decolonise Festival (November 4) and fundraising event (for a 2017 event) has been revealed. Check out details below. The contribution of people of colour to punk music and culture has been consistently and grievously ignored by history, and punx of colour continue to be undervalued to this day. This is why a collective of musicians, artists and creatives have come together to organise the first ever Decolonise Fest, which will be held in London early next year. 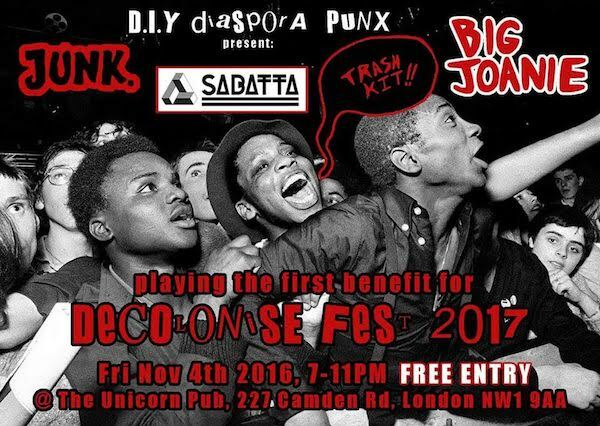 “Decolonise Fest will celebrate all the brilliant Diaspora Punx, who we define as people who are descended (through one or both parents) from the original inhabitants of Africa, Caribbean, Asia, Middle East, Latin America, Australasia, North America, and the islands of the Atlantic, Pacific and Indian Ocean. 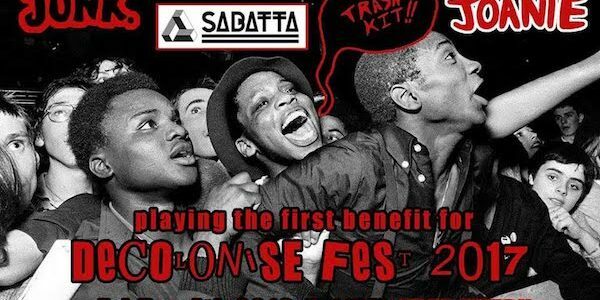 Feminist punks Trash Kit will headline with Big Joanie, who recently played at the inaugural edition of Afropunk in London, Sabatta and Junk supporting.